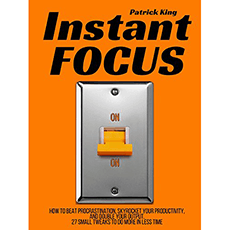 In “Instant Focus”, Patrick King stresses the importance of developing your focus in order to be more productive. It shows you how to motivate, organize yourself, and concentrate when it really matters. This book includes 25+ ways to use your time to its fullest potential and tips used by high-performers.